I've written before about Open Data and how we've leveraged it in North Carolina. North Carolina’s second Data Jam is focused on health and kicks off tonight at 7 p.m. We’re using a Start Up Weekend format, so we’ll start with pitches tonight and then form teams. The teams will spend the weekend developing their ideas. We’re using a broad definition of health, similar to what Robert Wood Johnson uses. So it not only covers disease states, health care providers, costs, etc., but also covers factors that contribute to the state of health like food, commute times and housing. I’m excited to see more state and local government agencies enter the world of Open Data and there are two that are of particular note. This year, the State Treasurer’s Office has provided data about disease states in members of the State Health Plan. Wake County has also entered the Open Data fray with gusto. They’ve been active participants on the data tiger team that pulled together Open Data for this year’s event. They’ve also liberated data about Parks and Recreation facilities, restaurants that locally source their ingredients, farmers markets and restaurant inspections. The way they’ve released the restaurant inspection data is particularly worthy of note. Wake County partnered with other local governments to release their inspection data in a standardized format called LIVES, so that applications can readily use the data. 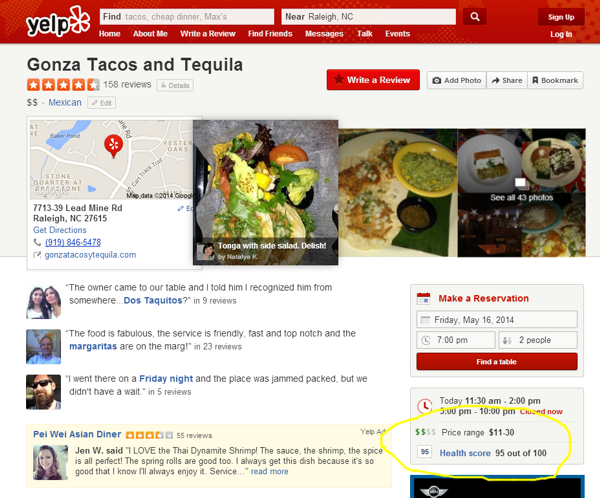 As a result, if you look up restaurants on Yelp in Wake County you’ll see their sanitation scores. Just like last year, all the teams that participate in the TSW Health Data Jam will be eligible to compete in September’s NC Datapalooza. In early August, teams will pitch their products and services. The leading teams will then participate in a 30-day accelerator, getting access to business coaching and technology, and vie for the top Datapalooza prize in September. Open Data continues to build around the country and around the world. It’s realizing more of its potential to leverage untapped government resources to create new companies, jobs and improved services. NC is one of ten states without any current activity on an APCD and things have been pretty quiet on that front in NC. Here's a good resource to track APCD activity - http://apcdcouncil.org/state/map.